I desired you to send the Things you used annually to send me ... I ... shall not import any more necessaries till the hateful acts are repealed. The Ministry promised to get a Repeal of that imposing the Duties on Glass Paper & Colours; But, tell Them in plain English, That alone wont satisfy America ..." — William Nelson to merchant, Mr. John Norton in London, November 18, 1769Before the American Revolution, this narrow footpath, cutting through the Great Valley, was a major thoroughfare that linked Yorktown's busy waterfront district with businesses and government offices on Main Street.At the head of the Valley were the Nelson stores, started sometime in the first decade of the 1700s by English immigrant, Thomas Nelson. Nelson's merchant business thrived at this location, and richly supported the efforts to repeal British taxes on imports. 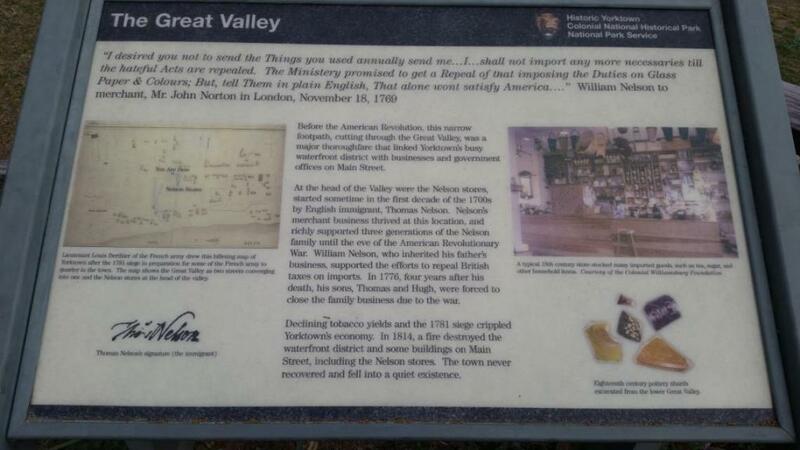 In 1776, four years after his death, his sons, Thomas and Hugh, were forced to close the family business due to the war.Declining tobacco yields and the 1781 siege crippled Yorktown's economy. In 1814, a fire destroyed the waterfront district and some buildings on Main Street, including the Nelson stores. The town never recovered and fell into a quiet existence. This marker can also be identified by its HM code. You can use the hashtag #HM1JPT in tweets, and any other place where you might refer to this marker, including when searching on this site.